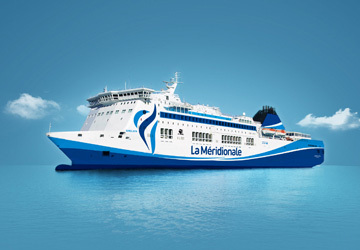 La Méridionale operates numerous weekly sailings between the south of France and the island of Corsica, in the Mediterranean Sea. La Compagnie Méridionale de Navigation was founded in 1931, when Henri and Félix Rastit married the daughters of a ship owner called Gianonni de Cassano in Balagne, rebranding to simply 'La Méridionale' in 1998. First focussing on freight deliveries, the company eventually established a passenger link from mainland France to Corsica in 1988. 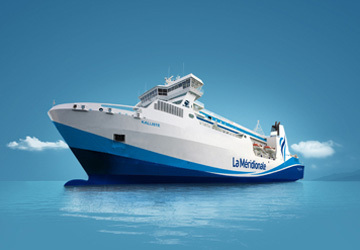 They became the first French ship-owner in the Mediterranean, running passenger services, to obtain international quality certifications in 1996, while they were also awarded for the implementation of an Environmental Management System in 2009. The ferries sailing to and from Corsica are named Piana, Girolata and Kalliste, carrying approximately three hundred thousand passengers each year, and over a hundred thousand vehicles to the towns Ajaccio, Bastia and Propriano twelve times a week. On-board you will find all the necessaries for a pleasant voyage, with friendly staff, quality French cuisine prepared from fresh produce, large promenade decks, Corsican music, spacious cabins and a cinema. Direct Ferries provides a ferry timetable and price comparison, based on your search criteria, allowing you to compare La Meridionale products with multiple ferry company timetables and fares in one search. 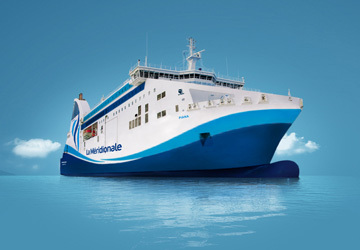 Compare La Meridionale timetables and prices now with all alternative ferry operators before booking your ferry ticket to ensure you get the best option for your ferry trip.